I didn’t bribe anyone. I didn’t have an intern to sit outside for hours waiting for the Dominique Ansel Bakery to open. 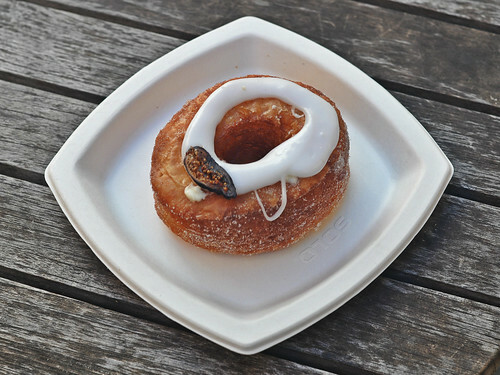 So, how did I get a cronut without waiting? Well, Chef Ansel recently played a little 21 questions game on the Twitter in anticipation of revealing his latest pastry creation. I love games. Logic games especially. While I was keeping a side eye to the chatter as Chef Ansel answered people’s questions, it wasn’t until he started dropping some serious hints that I jumped into the fray. Knowing that the dessert was chocolate and likely a soufflé, but also another very French dish that had some of the similar flavoring of the soufflé, started piecing things together and guessed that the new pastry was an orange blossom brioche filled with a Grand Marnier soufflé and I was right! In addition to the gratification of guessing correctly I also won a cronut and a magic soufflé which would be held for me at the bakery. No line! Woot! Saturday we met up with Lawman-in-law in the bakery’s back garden to claim my prize and sample the bakery’s wares. First up, the coveted cronut. Lawman is not a fig person. Nor is he a mascarpone person. So he was more than a little disappointed to discover that was the flavor of the month (and cronuts only come in one flavor). One bite made him a believer. 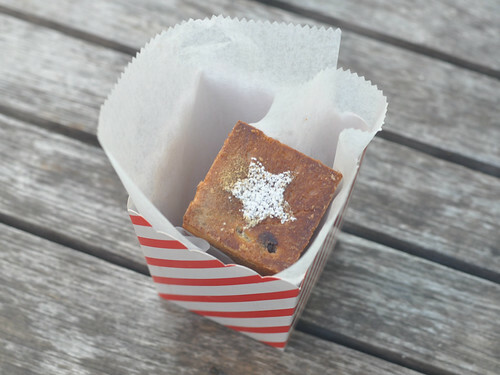 The pastry was as light and tender and flakey as I’ve heard. It wasn’t the slightest bit greasy or heavy. And it had just the right amount of filling to infuse it with flavor without making it messy. The fig wasn’t in your face figgy, it was pleasantly mellow. 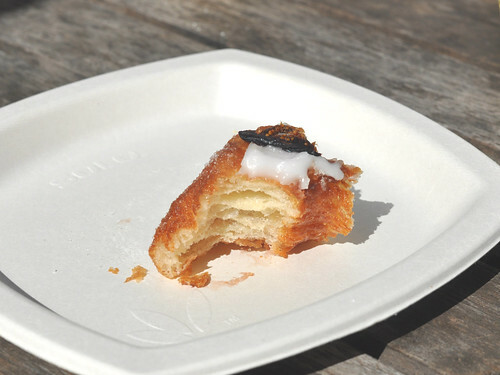 I’m sure others have said all there really is to say about the cronut and then some. It’s tasty. It’s impressive (how is it so flakey and light?!) It’s fun. The magic soufflé was another work of sheer genius. You must eat it hot and it’s best if you just tear into it with your bare hands. It’s essentially a pocket soufflé. Again, Lawman isn’t a big fan of the citrus chocolate combo, but here the orange and orange blossom weren’t overpowering, they perfectly complimented the chocolate. The brioche was tender and the soufflé inside was still warm and oh so good. I wouldn’t pass up either of these fine treats, but if I had to choose or I’d say go for the soufflé and stay for the DKA, the signature pastry which is essentially a caramelized croissant (I know, it blew my mind, too). I don’t have any pics of the DKA because we ate it too quickly, but I would make a special trip for that alone—did I mention that it’s a caramelized croissant?! And you don’t need to stand in line for 3 hours to get one. In fact, I kind of want one now. If you are reading this in the wee hours and have nothing to do this morning, you could hop out of bed and head to Madison Square Park where for one day only Shake Shack and Dominique Ansel are partnering for the Cronut Concrete to benefit the Widows & Children Foundation of NYPD. There are only 1000 concretes available and the first 100 folks get a sweet t-shirt. Doors open at 10 am, an hour earlier than normal and, well, I don’t have to tell you that there’s going to be a line.